The Seattle Aquarium aims to be inclusive and welcoming to all, and believes that our audience should reflect the diversity of our region. Toward that end, the Seattle Aquarium Connections program provides complimentary admission tickets through community partner organizations. 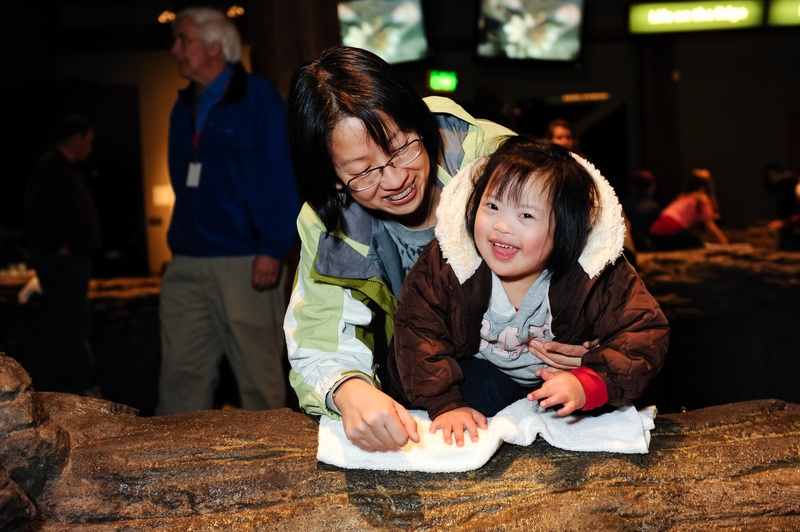 The goal of Seattle Aquarium Connections is to provide opportunities to experience the Aquarium to those in our community who might otherwise experience barriers to engaging with us. To support our mission of Inspiring Conservation of Our Marine Environment, we hope to create authentic, mutually beneficial relationships that build trust among the Aquarium and our partner communities, and provide quality, culturally relevant marine conservation educational experiences to all. New to Seattle Aquarium Connections? Who qualifies for the program? Eligible partners include service-based nonprofit or governmental organizations that support members of marginalized communities including but not limited to: low-income families; communities of color; immigrant and refugee communities; people with disabilities; the deaf community; people who are blind; families or individuals experiencing homelessness; and others. If your organization is interested in becoming a partner, please apply here. What is expected of Seattle Aquarium Connections partners? Connections partners must designate one main contact to order and distribute Aquarium tickets for the organization. The designated main contact will represent the organization and act as a liaison between the Aquarium and any coworkers who may want to use Seattle Aquarium Connections tickets. The main contact will make all group reservations and order all individual tickets needed by the organization. They are also in charge of making sure that all tickets distributed are tracked on the distribution logs provided by the Aquarium and returning those distribution logs before ordering more tickets. Further, the main contact is responsible for educating all programs and individuals within their agency about the Connections program. If the main contact changes, it is the responsibility of the Connections partner organization to inform the Seattle Aquarium of the change. The Seattle Aquarium lists all Connections partner agencies and links the main contact on our website. What types of tickets are distributed? The Seattle Aquarium Connections program distributes two types of tickets to our partner organizations. Group reservations: Advance, online registration is required for groups of 10 or more people (including chaperones) who are coming to the Aquarium together. You will receive an entrance confirmation to bring when entering the Aquarium. This helps keep down the cost and waste of printing paper tickets. Individual tickets: Individual tickets are distributed to qualifying families and patrons of partner organizations who wish to visit the Aquarium on their own. Tickets must be recorded in the distribution log and are valid for six months from the date they were printed. If you are an organization bound by confidentiality laws, please make a note on your log and include all the information you are able to give. Aquarium tickets may only be distributed to staff members of partner organizations if said staff qualify for services that you provide. Tickets should never be used as a reward, incentive or donation item for fundraising. They do not have a cash value, are nontransferable, should never be sold, and are not to be given to employees or non-qualifying individuals for personal use. A description of the demographics and/or populations you serve, as well as the number of people you serve. Apply online here. If you have any questions about the online application, please call: (206) 693-6139 or email connections@seattleaquarium.org. These cards must be signed by a DCYF employee or authorized personnel of a kinship navigator support program AND accompanied by a valid, legal form of ID (such as a driver’s license or passport). The name on the card must match the caregiver’s ID. This program does not cover additional adults or children who are not residing in the home. If you need a wallet ID card, contact your licensor or home study writer at the DCYF Licensing Division (formerly the Division of Licensed Resources (DLR)) or your licensing agency. Relative/kinship caregivers who have full custody of relative children should contact their kinship navigator or one of the kinship navigator programs in Washington to obtain the necessary identification cards. Already an Aquarium Connections partner? How do I get tickets as a Seattle Aquarium Connections partner? To order Seattle Aquarium Connections tickets, your organization must be a current partner in good standing. All Aquarium ticket requests must go through your agency’s designated main contact. Find a list of our current partners and their main contacts here. You must record all tickets you give out in a distribution log. Please fill out as much information as you can, as this allows us to get a better understanding of which audiences we are reaching and identifies areas of improvement. To keep the program sustainable, we encourage group reservations be made when applicable. This helps keep down the cost and waste of printing paper tickets. When visiting the Aquarium with a group of 10 or more people, you can make your reservation with at least two weeks’ notice (more lead time may be necessary in the summer). A great option for field trips! a) Designated main contacts must make the reservation at least two weeks before the desired date. b) Fill out this form. c) Be sure the designated main contact is filling out the information. d) Enter the organization name and main contact’s information. e) Select the type of tickets you’re requesting (“visiting the Aquarium as a group”) and fill in the applicable information. f) Include contact information for the staff member who will be point person on the day of the visit (if different than the designated main contact). g) You will receive an automated email after submitting your request. If you do not receive this email, we may not have received your request. h) Once your request has been approved by the Seattle Aquarium registrar, you’ll receive an entrance confirmation letter by email (this may take one to two business days). i) You must print and present your entrance confirmation on the day of your visit. j) For more information on planning your visit, click here. k) For questions regarding registration, call our registrar at (206) 693-6196, Monday–Friday, 7:30am–3:30pm, or email registration@seattleaquarium.org. The designated main contact must fill out this form. Select the type of tickets you’re requesting (individual printed tickets) and fill in the applicable information. Specify the total number of tickets you would like to order for entire organization. You must record all tickets you give out in a distribution log, which can be printed here. Please fill out as much information as you can, as this allows us to get a better understanding of which audiences we are reaching and identifies areas for improvement. If bound by confidentiality laws, please fill out what you can. Completed distribution logs must be returned before you place your next order: email them to registration@seattleaquarium.org; fax to (206) 386-4328; or mail to Seattle Aquarium, Attn: Jasmine Williams, 1483 Alaskan Way, Pier 59, Seattle, WA 98101. Organizations that regularly fail to return their distribution logs risk losing their good standing with Seattle Aquarium Connections. How many tickets can I order? At this time you can order as many tickets as your agency can effectively distribute and record. Please note that printing tickets does incur costs, and before your next order is filled we will look at your redemption rates and number of tickets distributed in your logs to evaluate if they are being used. When can we come to the Aquarium? Seattle Aquarium Connections tickets are valid during all open hours at the Seattle Aquarium, including special events such as Deaf Community Day, Ocean Career Day, Discover Science Weekend, Family Science Weekend, Octopus Week and Fishtival. A calendar of all our events can be found here. The Seattle Aquarium is open daily from 9:30am to 5pm. Last entry at 5pm; exhibits close at 6pm. Exception: The Seattle Aquarium is closed two days each year year—December 25 (Christmas Day) and one Friday in June for our annual Splash! fundraising gala. Spring and summer, weekends and around the holidays are our busiest times. Interested in engaging with us beyond the Aquarium walls? Beach Naturalist program: schedule a time to join us on a local shoreline at low tide for a beach animal program. Cedar River Salmon Journey: schedule a time to join us along the Cedar River or the Ballard Locks as we watch sockeye, Chinook and coho salmon head upstream to spawn. Programs at your location: we can come to your site to host a booth or give an educational program or presentation on an as-available basis. For more info on themes, programs and logistics, contact Jasmine Williams. 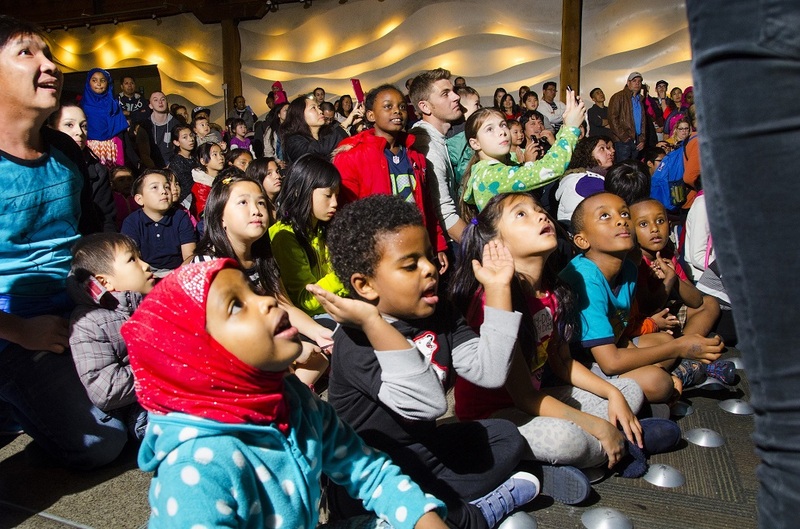 For more information on any of our outreach events, please email connections@seattleaquarium.org. An individual or family looking for Connections tickets? How do I get tickets as an individual or family? The Seattle Aquarium does not distribute tickets directly to individuals. If you qualify, there are three different ways you could possibly obtain Seattle Aquarium Connections tickets. 1. If you have a Seattle Public Library card or King County Library card, the Seattle Aquarium participates in the Museum Pass program, which allows you to essentially “check out” a family pass to the Aquarium. More information on the Seattle Public Library Museum Pass program can be found here, and here for the King County Library Museum Pass program. Please check with your local librarian for more details. 2. If you live within the City of Seattle you can visit your local Department of Parks and Recreation community centers. All City of Seattle community centers have access to Aquarium tickets. If you are having a problem getting in touch with someone, please email connections@seattleaquarium.org. 3. If you are already a member of one of our partner organizations, you may be able to obtain tickets through them. You may only contact our partners if you are part of their programming. When can we come to the Aquarium with our Connections tickets? You can visit the Aquarium during any of our regular hours. We’re open daily from 9:30am to 5pm. Last entry at 5pm; exhibits close at 6pm. Exception: The Seattle Aquarium is closed two days each year year—December 25 (Christmas Day) and one Friday in June for our annual Splash! fundraising gala. Check our website for details. DreamNight is a free evening welcoming children and adults with a disability or serious medical condition and their families. These families are able to explore the Aquarium and activities that are accessible to all their families and have told us how wonderful it was to not feel self-conscious being out in public. Open House is a community event to welcome families through our Aquarium Connections partner organizations that work with immigrant and refugee families and low-income communities especially in South Seattle neighborhoods. Participants are able to fully experience the Aquarium in an engaging and culturally appropriate way with their community in a safe environment.